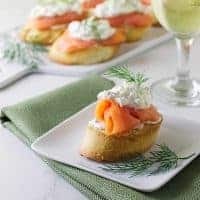 You will love these crunchy mascarpone and smoked salmon bruschetta appetizers that are made with creamy mascarpone cheese, capers and dill. 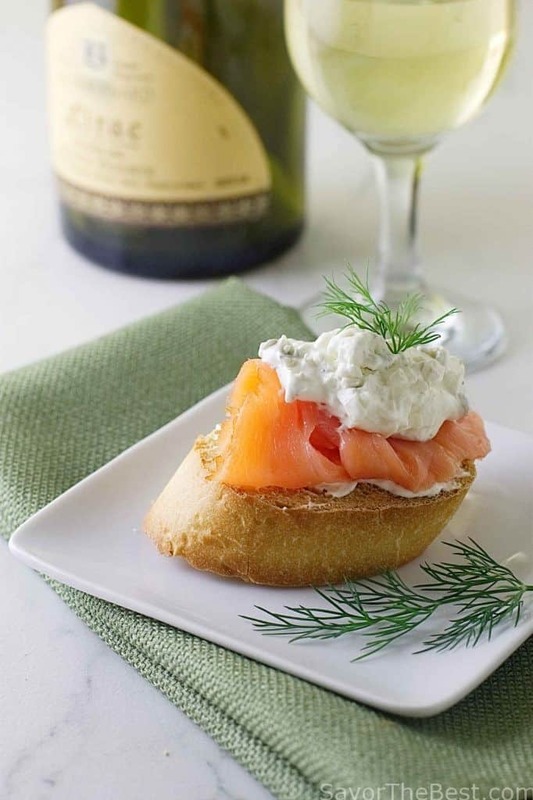 Recently, Don and I ate dinner at a restaurant and we shared an appetizer of mascarpone cheese with smoked salmon. It was delicious and it inspired me to re-create it in my kitchen. I served this as one of the appetizers for his birthday party last month and there was not a crumb left on the plate. Also, my niece, Abby and her husband Ian, are visiting from Alaska and they joined us for dinner last night and I again served this bruschetta as the appetizer along with our wine. They loved it! We probably could have just eaten the appetizer as our main entree and skipped the pot roast. Bruschetta is traditionally grilled or even fried and the bread is chewier, but I like mine crisp and crunchy so I chose to pop the bread slices into the oven until golden brown and then rub the toasted bread slices with fresh garlic before adding the smoked salmon and mascarpone mixture. 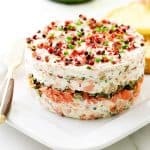 The creamy mascarpone mixture takes just minutes to put together with a bit of whipping cream to give it fluff, chopped capers, onion, fresh dill and tangy lemon juice. The thin slices of smoked salmon add texture and flavor. This is one of those ‘elegant’ appetizers that you will be serving often. 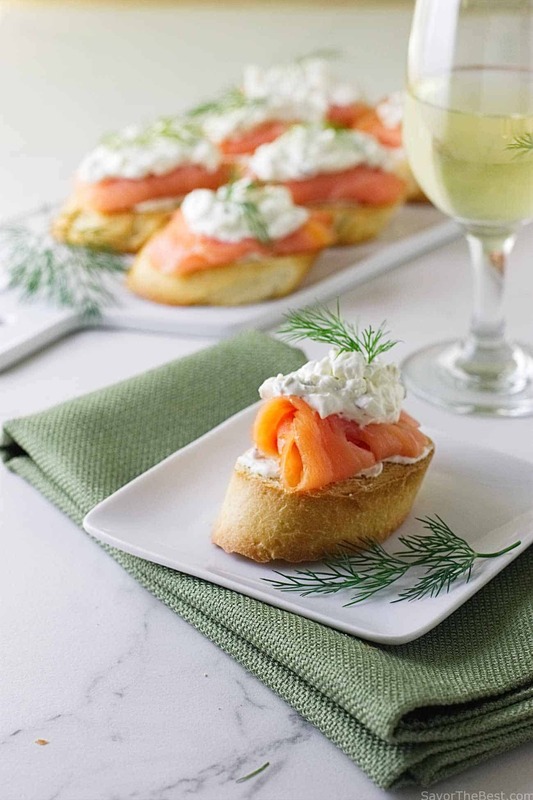 A crunchy bruschetta appetizer with creamy mascarpone cheese mixed with capers, lemon juice, onion and fresh dill arranged on top of thin slices of smoked salmon. 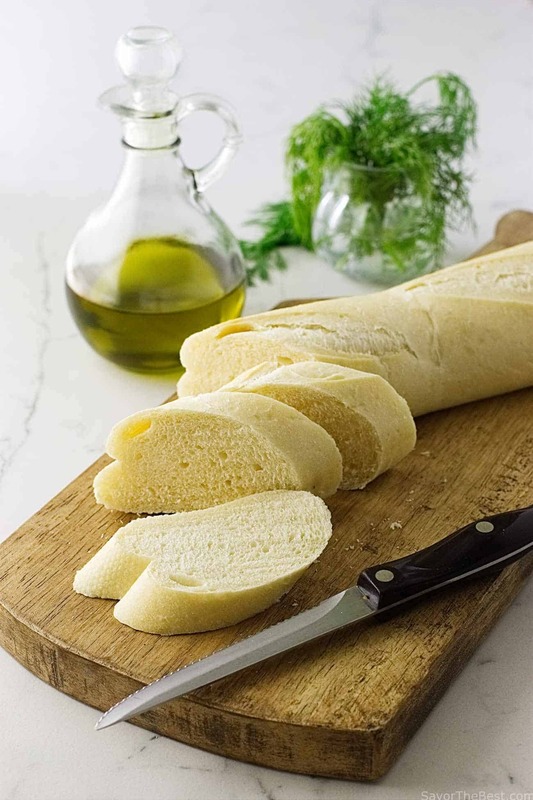 On a baking sheet lined with parchment paper, lay the baguette slices in one layer. Using a pastry brush, lightly brush the slices with the olive oil. Transfer to the oven and bake until they are golden toasted and crisp. Remove from oven and carefully rub the garlic clove lightly across each bread slice. Transfer bread slices to a wire rack and cool. You will need 30 slices for the bruschetta, reserve any remaining slices in an air tight container for another use. In a small bowl, add the mascarpone cheese and sour cream and blend until smooth, add the lemon juice, salt and the cream, whip just until soft peaks form. Remove bowl from the mixer and fold in the lemon zest, capers and scallions. Using a small spatula or butter knife, smear a small amount of the cheese mixture on each of the bread slices to anchor the salmon. 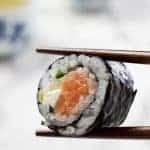 Place a slice of salmon, large enough to cover the bread, on the cheese smear and top the salmon with a small rounded teaspoon of the cheese mixture. Spoon the mixture over part of the salmon, spreading it out slightly and garnish with the dill or parsley. Enjoy! The cheese mixture can be prepared the day before and refrigerated. Bring it to room temperature before assembling the appetizers. Lovely combination! These look delicious! 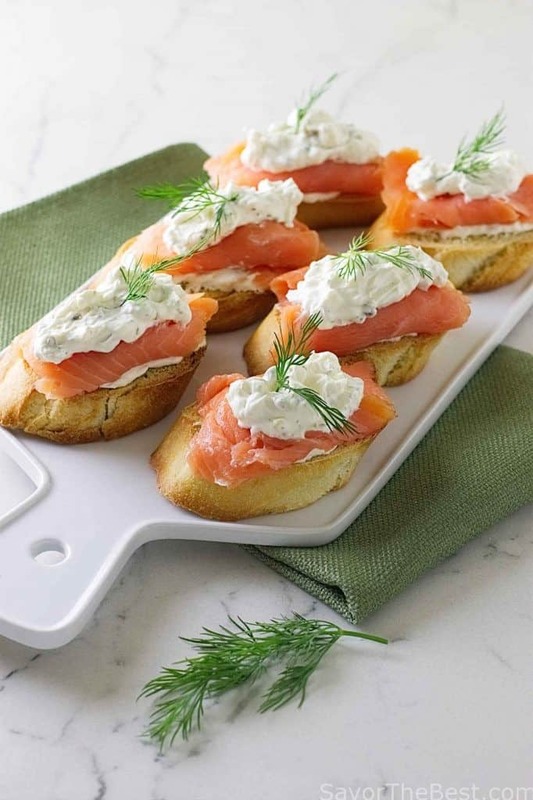 We love smoked salmon with anything, but it pairs particularly well with a soft cheese. This is wonderful — simple, yet it looks SO flavorful. Best of all, it’s really pretty. Thanks! These look beautiful. Have you tried it with the salmon on top of the cheese mixture? 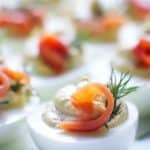 I’m catering and looking for the best composed bite. Excited to use this! This sounds wonderful! We love both salmon and mascarpone! Who knew these two combined would work so well. Thanks for recreating the recipe – great job! Oh that was so sweet of you to stop by and say hello! Thank you for leaving a lovely comment! Hi, ladies….yes, the smoked salmon really is delicious with the mascarpone. When it was served in the restaurant the smoked salmon was minced up and blended with the mascarpone but I changed it. 🙂 Hope you try it soon. Love how fluffy the mascarpone mixture looks on the bruschetta. Luscious combination of ingredients! I love gaining inspiration and ideas for my kitchen from my experiences at the table of others, whether a favoirte eatery or a dear friend. This bruschetta looks tasty and perfect – nicely done!! Whoa that sounds so good! I absolutely adore smoked salmon! One of my fave things to do is re-create dishes from restaurants at home and this one looks like a keeper! I’ve been wanting to try mascarpone in a few more ways and this would be perfect!